it may seem that the last heat wave just left, but the change of the season is upon us and it’s time to start planning holiday gifts & mailings. The year-end holidays are a great time to take a minute out of the daily grind to show your appreciation and send something special to your partners, vendors and clients to acknowledge how much you appreciate working with them. in the grand scheme of your brand, client appreciation is an opportunity to expand your brand personality and strengthen relationships by showing people that you value them beyond the work you do together. the best way to make sure this all goes off without a hitch is to plan ahead so you can strategize what you want to send, work with the designers and vendors you want, and avoid rush charges with vendors that are overloaded with the holiday onslaught. to make it easy, use this guide to consider your approach, decide what to send and source people who can make it happen. since the number of recipients will determine which items or print processes make the most sense, the first thing to do is sit down with your client & vendor list and determine how many pieces you’ll be sending. some of us have 20, while others will have 2000 and beyond. you’ll also want to determine if there are tiered groups within your list, such as clients and partners above a certain dollar amount or who comprise a majority of your business and time vs. contacts you wish to keep in touch with. if you have a long list of names, this will help you decide how to break it down and find solutions for each group of recipients at each level. consider that printing and mailing alone will take about 3 weeks on a standard turnaround, and that you’ll want to beat the rush and mail by the first week of december. if you’re working with a designer on a print piece, you’ll want to allow at least a month for the design process [this is a rough estimate, but to insure you can get the results you want with the designer of your choice, over-estimate here]. similarly, if you are ordering cards or branded gifts, you’ll want to build in time to research the ideal gift and time to have it customized. the turnaround will vary from vendor to vendor, but again, plan on about a month. that means, yes, it’s time to get the ball rolling in early october. i’ll get it out of the way upfront: a few options i’m not going to focus on here are pre-packaged gift baskets or branded gifts that involve putting your logo on a gift item. there are endless resources for going that route, and if those are avenues you want to take, my only advice is to customize it as much as possible. send your baskets with a personalized card, and if you brand a gift with a logo, make it a useful & relevant item to your target market. 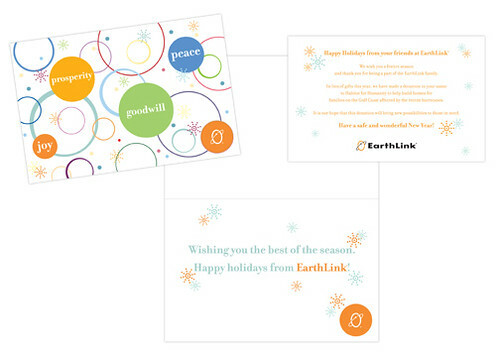 there is also the choice to donate to a the charity of your choice, which is what earthlink did in the sample above, detailing the contribution in an insert with the card. since there are so many worthwhile organizations out there, my advice is to choose the one that’s right for you and send a little information about them to your recipients to raise awareness. there are a few levels of personalized communications that i think are key for holiday mailings. the most universal is a designed card that shows your branding with a thoughtful message, something that can be sent to all levels of clients & contacts. if it isn’t in your budget to hire a designer and print a card, or if your quantity of recipients makes printing cost-prohibitive, before you run off to a big card company, consider shopping around in your design community or on a craft site like etsy for designers who do packs of original art for screen-printed or letter press cards in the quantity you need. look for something you identify with that will also communicate well to your clients. if a holiday card was already in the budget and you want to go a bit bigger with a branded gift, consider some sort of holiday kit that will be useful, helpful & memorable with your clients. i have seen some really nice packages where companies partner to create joint gifts they can send to both company’s holiday lists. a great example was something we received from the department of graphic sciences last year, which included a branded coffee mug, a set of illustrated cards by the designers, and a pack of artisan brittle by morning glory confections. this gift was a great combination of something we could use with their logo, artistic objects we could send to our own colleagues, and some really unique sweets to enjoy, all of which promoted & introduced each partner in the process [and here i am talking about it nearly a year later]. check with your favorite neighborhood shops, local farmer’s market vendors, or contacts in your chamber or industry organization for artisan food or specialty item vendors you might click with. or leave it to us–your designer will be able to come up with some great suggestions. this is really the branding part of the project, considering your constituents and finding that special mix of what sends the right message from your company and what hits your recipients in a way they’ll remember and appreciate. if you’re stuck on how to brainstorm on this, ask your employees. they often have relationships with your clients that you don’t, and can have great insight about gift ideas. if you want a more strategic approach, talk to your designer or brand strategist about how to extend your brand to your holiday gifts. we’ll be able to take your goals and corporate voice and personal connection to your clients, and create a memorable communication with everyone on your list. if you have your list together and have some idea of where you’re ready to start, it’s time to get moving. if you have a designer on staff or on hand for these projects, make the call and put a production schedule on the calendar. if you need help finding the right designer, i have helpful information on how to find the right one for your business. or hey, you’re talking to one right now, ask away!